Shows Elements of Universe and Samples of Minerals or Crystals Containing the Element in Question. Shows common and rare samples - some only found in space! Some samples are quite common, but others are so rare only microscopic specimens are available for study. For certain elements, there are no examples of minerals on Earth. In these cases the element is shown where it occurs in space, whether in star-forming galaxies or the tail of a comet! The man-made elements are shown in graphics describing how they were created in the lab. Four years of preparation, and thousands of dollars in rare samples are represented. 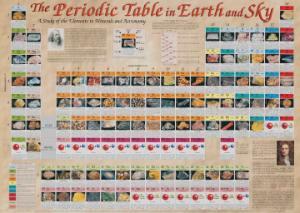 Providing the usual periodic table poster details of element symbols, numbers, atomic weights, electron configurations, etc. 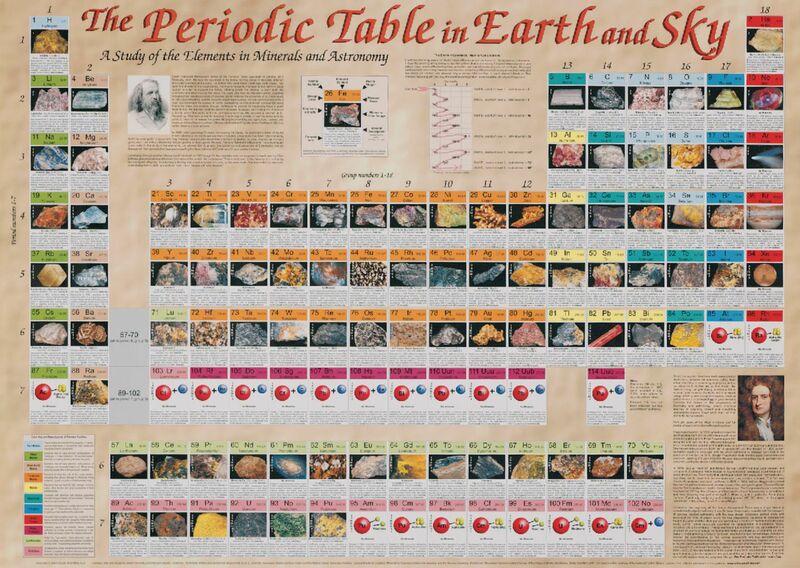 The Periodic Table in Earth and Sky also gives information about the discovery of each element, its ranking in earthly and cosmic abundances, where it occurs, how it is used commercially, and how toxic it may be in its mineral form.